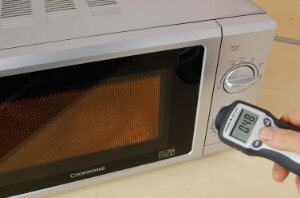 Previously microwave leakage testing was part of the standard PAT test. This requirement was removed from the Code of Practice when it was updated from the 3rd to the 4th edition. “Information on microwave leakage testing is not within the remit of this Code of Practice, because it does not directly relate to ‘electrical safety’. For this reason microwave in-service leakage testing has been removed.” - IT Code of Practice, 4th edition. Although the leakage test requirement has been removed from the Code of Practice, it still often makes sense to carry out a microwave leakage test at the same time as the standard PAT. 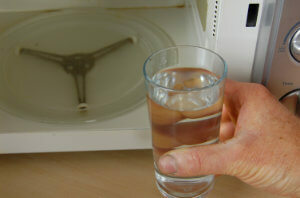 For clarification, the microwave leakage test is the testing of microwave ovens for microwave radiation leakage. Not to be confused with the protective conductor current test, often referred to as an earth leakage test. Food in a microwave oven is heated by absorbing microwave energy. The microwaves penetrate the food or liquid causing the molecules to vibrate against each other which produces heat. The microwave energy is safely contained within the oven by the metal cooking chamber which acts like a Faraday cage. The viewing window on the door has a conductive mesh with a hole size that is smaller than the microwaves wavelength, this prevents the microwaves from passing through the door. The seal around the door is also designed with a cavity to absorb any stray radiation. The maximum permitted leakage level is 5 mW/cm2 at a distance of 50mm from the surface of the oven (mW/cm2 is the power present in one square centimetre). 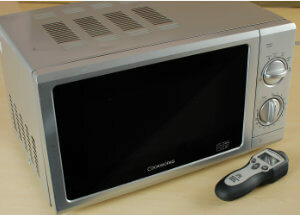 A microwave is also required to have two independent interlock systems that stop the cooking process as soon as the door is opened. A large cup of water, roughly 275 ml, should be placed inside before starting the test. Turn the microwave on for 1 minute at full power and slowly move the detector around the case, paying particular attention to any air vents, the door and the door seal. 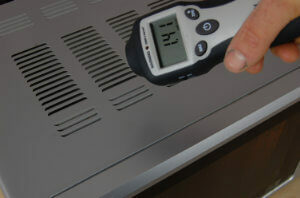 The detector should be held 5cm from the surface of the oven. If the microwave stops before the test is finished, the water in the glass should be replaced and the oven switched on for a further minute. In general it is the door seal that is most prone to cause leakage. Worn or broken hinges, corrosion, or a build up of dirt around the door seal can cause microwave leakage. Finally the door interlock should be tested by opening the door whilst on full power, this should immediately turn off the cooking process.